Just down Otter Creek from the falls in MIddlebury, down a steep slope from Main Street, where the bridge to Marble Works lands in front of the old Frog Hollow Mill, Edgewater Gallery has installed a magnificent great bull elk by Jonathan D. Ebinger. 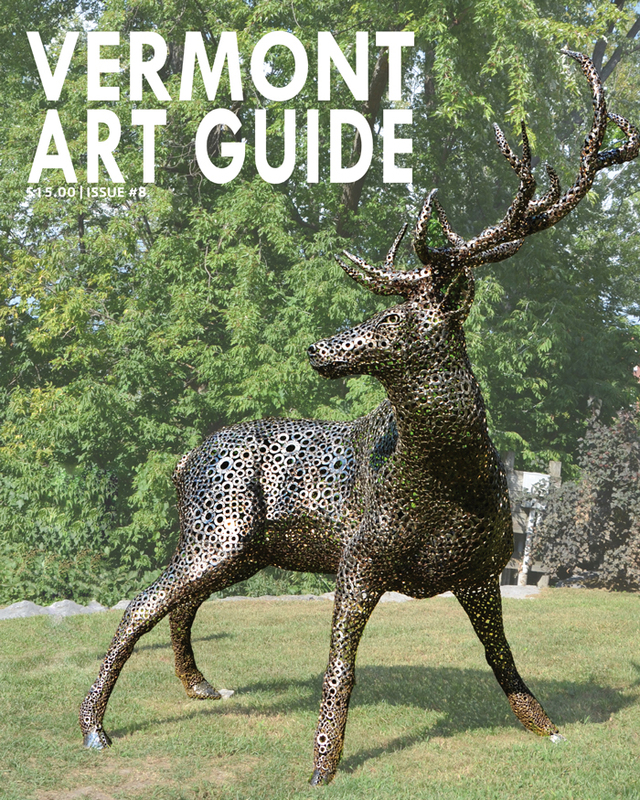 The steel sculpture graces the cover of this issue of Vermont Art Guide and Edgewater Gallery’s Kelly Holt shares a profile of the artist. In our round-up of Vermont Art News, we report on the culturally robust program of activities at Cold Hollow Sculpture Park. Shelburne Craft School says goodbye to painter Sage Tucker-Ketcham and gets a new director. Shelburne Museum inaugurates a New England Biennial. Art the Vote is a platform where artists can use their artwork to financially support candidates for office. The Vermont Institute of Natural Science is hosting its 4th Annual en Plein Air Festival. Lemon Fair Sculpture Park in Shoreham has new sculpture. We peek at the outdoor sculpture at the 26th Annual South End Art Hop. And Stone Valley Arts at Fox Hill gets a building. Vermont artists join a 50-State campaign for civic engagement. The issue has an article about the effort. In “Listening to Our Neighbors,” we review “The Fabric of Emancipation” at the Rokeby Museum in Ferrisburgh. Only in the past few decades have fiber art, textile art, and needle art been accepted as expressions of art worthy of the same level of attention and care we give painting and photography. These art forms have deep traditions among people of color and they are often practiced by women. Including them in the terrain of visual art complicates the narrative of art history which often leaves out women and people of color. September means The Kent Museum opens for the season. We share a preview of this year’s exhibition, “Backstory”, and an interview with the Curators. Giant contemporary folk art invades Brandon. We report on the superheroes at the Brandon Artists Guild. An essay on the animal paintings of Caryn King questions the place of this genre in the pantheon of contemporary art. “An Invitation to the Party” is a review of Eric Aho‘s exhibition at Highland Center for the Arts in Greensboro. We profile a portraiture and story collecting project by Burlington artist Corrine Yonce and share an interview with the artist. We wander the dreamy, otherworld paintings of The Front’s Michelle Lesnak. 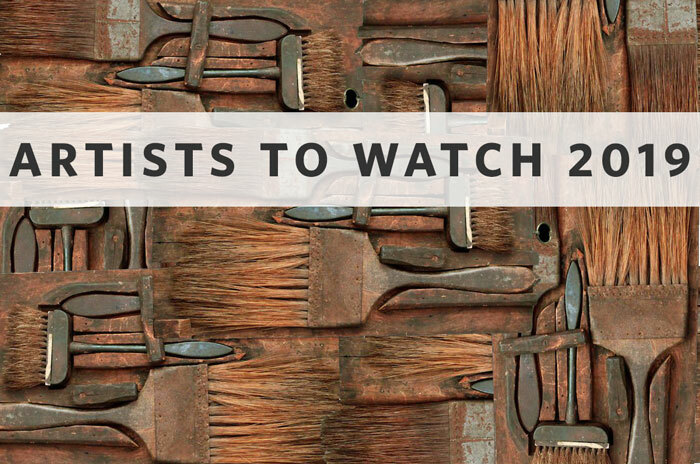 Where to See Art is our curated list of over 200 places to see art around the state. We shine a spotlight on Art Is Vital in Rutland | Philip Frey at the Edgewater Gallery at the Falls in Middlebury | Main Street Landing in Burlington | Amanda Pohan Turner’s “Maize Meditation” the McCarthy Art Gallery at St. Michael’s College in Colchester | and “Altered Spaces at the Spruce Peak Performing Arts Center in Stowe. 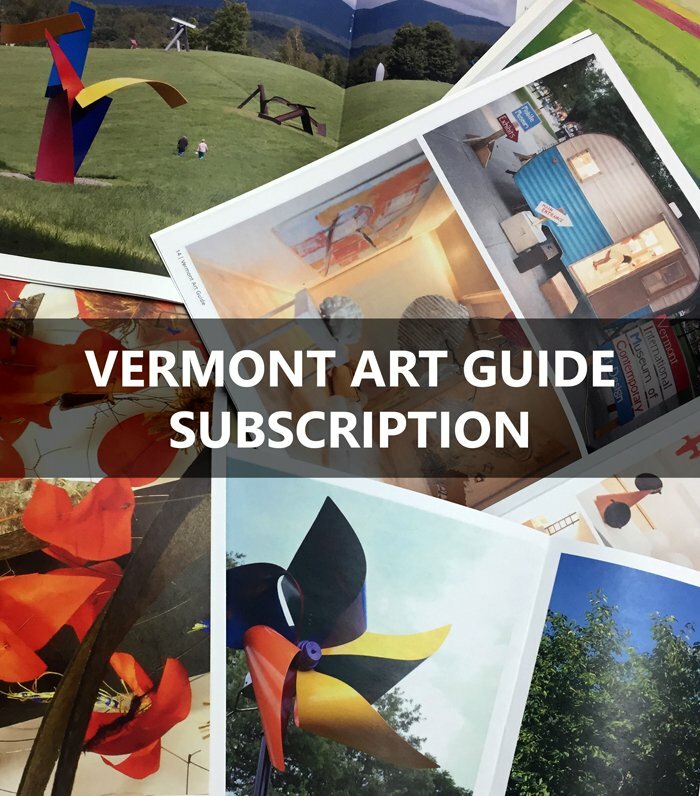 and a Vermont Art Guide Artist Directory. A special thank you to this issue’s Gallery Members whose support (along with that of our subscribers) makes Vermont Art Guide possible: Highland Center for the Arts, Catamount Arts, Vermont Artisan Designs, River Gallery School of Art, Cold Hollow Sculpture Park, Vermont State Curator, BCA Center, Edgewater Galleries, Two Rivers Printmaking Studio, Brattleboro Museum & Art Center, Champlain College Gallery, Axel’s Gallery & Frame Shop, GreenTARA Space, Bryan Memorial Gallery, Emile A. Gruppe Gallery, Art is Vital, Milton Artists’ Guild, Stone Valley Arts at Fox Hill, Middlebury College Museum of Art, Creative Space & Sean Dye Studio, Valley Arts. 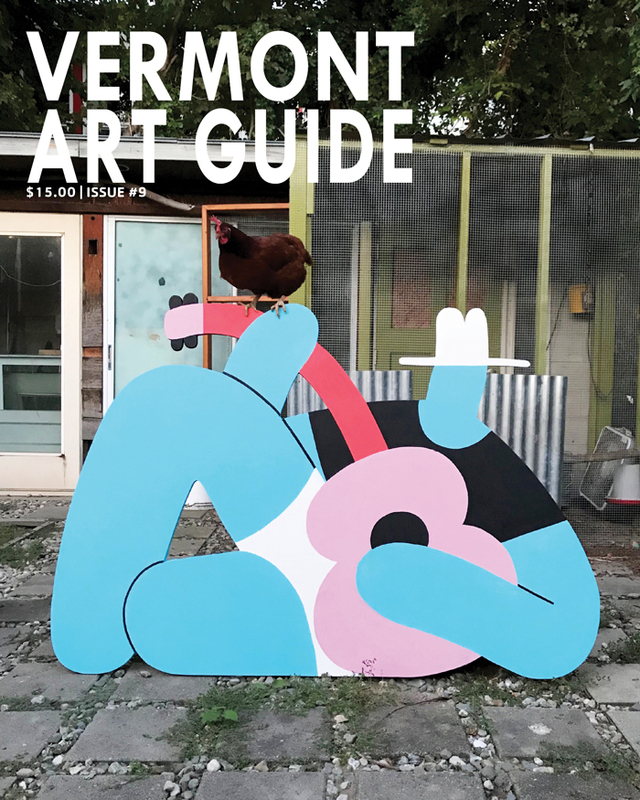 SPECIAL NOTE: Vermont Art Guide is a quarterly, printed magazine about contemporary art in Vermont. We have three goals: 1) To connect the entire state’s art community by sharing information about exhibitions and events. 2) To present a picture of Vermont art and art in Vermont, to tell our story. 3) To build an audience for Vermont art inside the state and out. We hope you will join us by subscribing to the print edition today!